Xils-Lab has released version 1.5 of StiX Drum Machine. Choke Pairs: 9 Choke pairs (HHop/HHcl, Toms Low/Hi, Percs 1/2, BD/Snare etc). MIDI Drag'n'Drop Pattern to DAW: You can now use D'n'D to export patterns in your Daw. In addition to MIDI Live export/recording allowing you to control external hardware or software drum machines with StiX exceptional XoX sequencer. Compressor: A user can insert a compressor pre or post reverb in StiX stereo output. This compressor, inspired by DBX designs, offers many compression types, from subtle to pumping. Envelope time dividers: 3 new time dividers (factors) on all 3 envelopes are now available. A user can now perform modulations on VCA, VCF, OSC freq, and other parameters. Noise filter: Oscillator 3 now has its own filter when the direct out option is active. The Noise filter also has it's own Q parameter, and comes in two flavors: LPF/HFP. Noise Direct Out: This ability to bypass the main filter gives A USR access to new topologies like the TR-808 snares. Snare body NOW goes to the main filter, while noise/snappiness bypass this filter. Sample Direct Out: This option allows a user to preserve the frequency content of samples, while adding traditional synthesis components using the analog oscillators, FM etc thru the main filter. Sample Start Offset: A user can now define the sample start position with a simple offset knob. This gives a much wider sonic palette for each single sample of your collection. Sample Reverse Mode: Samples can be reversed. Sample Name MouseOver: Use Mouse Over to display the full name of the sample used in oscillator 3 slot. LFO One Shot Mode: A user can not only mod the curves of any of the 3 envelopes, but also replace any of them by the LFO one shot, and use this now free envelope to modulate any target parameter. 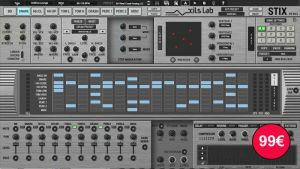 New Matrixes Mods: Noise Filter & Q were added to all matrixes destinations, including the sequencer Matrix, Macros 1 & 2 etc. 1000 new presets + updated manual: 50+ new global presets, each including up to 10 different patterns related to each other, 40 new drumkits including many pure analog kits, FM kits etc. 73 new drumpads, including vintage analog drum sounds. 800 new patterns, in different styles, including variations, breaks, fill-ins, bridge and chorus. Celebration sale period: 99€ (MSRP 179€) until March 5th, 2019. The update is free for all StiX users.